PHOTO OF THE WEEK #38 - Who is Who? You may remember that last Fall I had the opportunity to photograph some awesome dogs. One of those dogs was Carly. Unfortunately, Carly didn't make it and she passed away on March 17, 2010. I previously had photos from the Aussie Bounce for sale on my site with part of the proceeds to be donated to Carly's eye surgery. Between then and now, there have been no purchases from that gallery, however I will still leave it up, but will change it to proceeds going to the Southern Ontario branch of Aussie Rescue and Placement Helpline, Inc. in general vs. to one specific dog or event they are raising funds for. I've finally been able to sort through the ballot bag from the show last weekend. I found out who won the photo session that I donated to the silent auction as well. It was Sonia M in the 705 area code :) Sonia, I will be contacting you this weekend to discuss when you want to schedule your session for. 51 of those people indicated they did not want to be added to the mailing list. I know there was a fair number of people who stopped by who didn't fill in a ballot as well. My guesstimate would be around 20 or so people, but my assistants may have a better idea. I will hopefully get you 33 people added to the mailing list this weekend and will send out a message. Here is another peek at one of the photos I took at the show. My first vendor show. It was such fun and I learned so much. I wish I would have raised a bit more money for "My Sister's Place", as it was a charity vendor show, but maybe next time will be better with respect to that. I had to pick a photo that related to the show so I choose one of my booth. Not the most exciting, I know. But definitely relative to what was important in my life last week. You've seen it before, but here it is again as my Photo of the Week. ON THE BUSINESS SIDE: My feet hurt! And here was one of the little cuties who got her portrait taken and printed on-site. For next time, I don't think I'll try and do the portraits on-site as it took up a lot of extra space and wasn't very popular. Perhaps if there had been more kids attending? I think I'll have to just determine up front if I think it will be worth it. I also did a draw for a complementary photo session at my booth. Congratulations to Diane H. from Woodbridge who won that! :) I'm not sure who ended up with the session from the silent auction. Once I find out, I'll post the info. I did get a lot of people stopping by to have a look, which was great for local exposure. I just found out that there were about 350 people in attendance at the show today. Not bad for the little town of Tottenham, ON. :) I still have to go through my draw entry forms to see how many people entered. Not everyone who stopped by filled in a ballot, but it will give me a rough idea of how many visitors I had. I almost forgot to take some shots of my booth. The space was smaller than I was expecting and at the beginning there were stacks of chairs in the corner. But with some creative adjustments, things worked out just fine. After looking at it now, I should have tossed the extra white sheet I had over those chairs!! I saw some familiar faces, met A LOT of new people, snuck in some time to see some of the great businesses run by women in South Simcoe, did a little bit of networking, learned a lot about being in a vendor show and had a lot of fun along the way!! Thanks so much to everyone who stopped by today and also thank you to Sarah Toth and everyone who helped with organizing the event. OK, so last week I was busier with work on my computer vs. work behind my camera. I was working on so many things to get them done for the local vendor show this Sunday. The only pictures I took were some test shots I did while experimenting with the lighting for this Sunday. 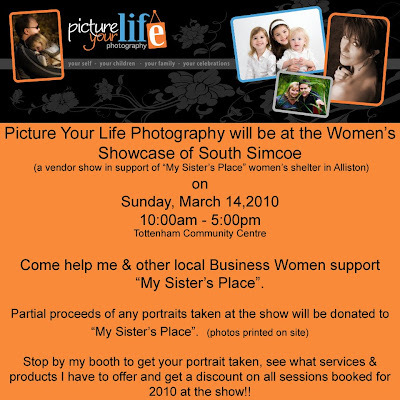 This weekend I'm going to be in a local vendor show in Tottenham, ON that is supporting a local Women's Shelter ("My Sister's Place" in Alliston, ON). I'm very excited as this is my first formal introduction to the local community. There will be a lot of local Business Women participating and I can't wait to see what products and services everyone has to offer and am looking forward to hopefully raising some money for "My Sister's Place". If you're in or close to the area, I hope to see you there!! Stop by, say hi and get your photo taken and printed on-site. Part of the proceeds will be donated to "My Sister's Place". Please see the following information for more details. There is also information posted on my Facebook Page. I had hoped to post this earlier in the week, but time just slipped by so quickly!. Of course, we had that awesome opportunity to get some photos with an Olympic Relay Torch. Soooo much fun and super cool! The kids grow up way too fast! Thank you guys so much for sharing this opportunity with us! And recently I've been making a lot of Amish Friendship Bread. To add some variety, I sometimes will make some of it into muffins. Even that was getting tiring so I decided to use this new pan Ben got for Christmas. Even the biggest boy in the house was trying to sneak one! Last week we finally received some snow worth mentioning. I had the opportunity on the Tuesday to get out and capture a little bit of that snow. I love when it's so fresh, clean and white. It doesn't stay that way for long in the city, but in the more rural areas where I live, that clean, white freshness can last a few days.